I am the one wearing this home-made costume. I wanted to create something that lit-up, and that was big enough to catch your eye in a huge room of costumes. This surely did it - LOL. 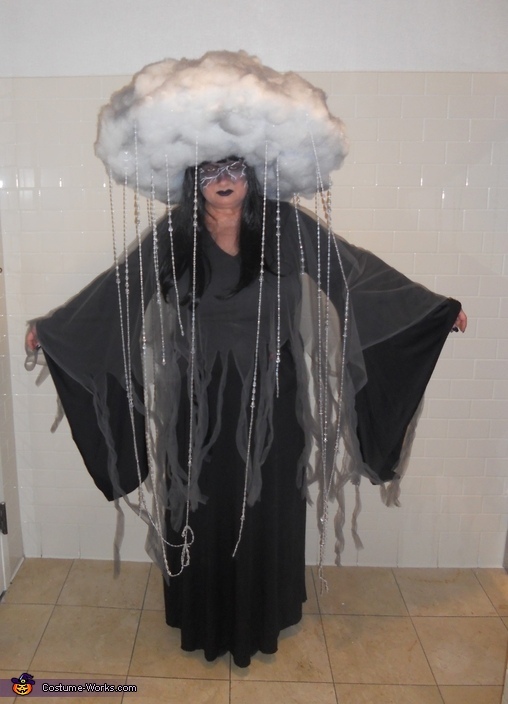 I saw a couple of versions of this "cloud" online, that were either made on an umbrella or was made out of material with no lights to wear on your head. I wanted flashing strobe lights in mine, so it looks like a stormy rain cloud with lightning. So I secured 3 battery packs inside my headpiece wiring - before glue-gunning the poly-fil on top and underneath. These lights were controlled by a remote, which I had placed inside a small pouch that I wore around my waist-belt. I then spray-painted the "cloud" here and there with gray spray-paint.....to give it the look of being 'gloomy'. Then wired on the strings of raindrops to the outer & inner rims of the wire headpiece. I wore a long black dress and made the gray wispy cape to go over the dress. I wore a black wig and did my make-up with lightning bolts and dark clouds on my face. Everyone LOVED this entire look at both of the parties I attended (where there were hundreds of people at each one)! !